Sunflower seeds aren't just for the birds, they are a nutritious snack to enjoy alone or as part of a trail mix. 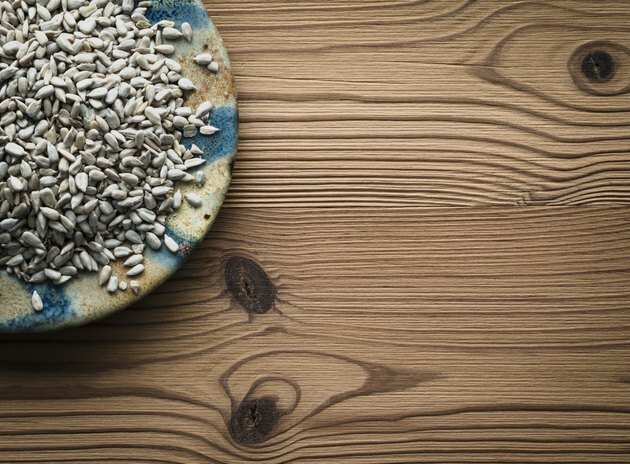 Roast a cup of sunflower seeds in the oven and sprinkle with salt before eating. A cup of sunflower seeds is four times the normal serving size of 1/4 cup, according to Calorie King, and contains 745 calories. A full cup of the seeds contains 98 percent of your total fat allowances, or over 63 g.
Sunflower seeds are rich in protein, potassium and calcium. One cup of the seeds contains 24 g of protein, 89 mg of calcium and 1088 mg of potassium, according to Calorie King. A cup of sunflower seeds also provides you with 22 percent of your daily sodium needs, or 525 mg.
Sunflower seeds are a high-fiber food, according to MayoClinic.com, and can help regulate your digestive system. One cup of the seeds contains approximately 11.5 g of fiber, as listed in Calorie King.